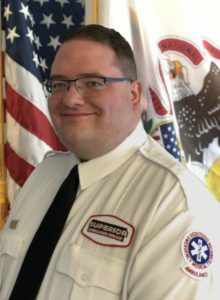 Dane began his EMT career as a member of the Superior Air-Ground Ambulance Service team in July 2007. Since then, he has happily taken on more responsibility as he’s advanced within the organization. In his current role, Dane is responsible for the supervision of more than 100 EMT professionals. It’s a demanding, all-encompassing role that includes the on-boarding and acclimation of new hires, quality assurance training, education, new employee development, employee relations, customer service, problem resolution, and assorted management and leadership tasks, for good measure. Dane is the kind of person who will do whatever he can to help those around him succeed, and he has the passion, love, and enthusiasm that make him one of our agency’s most up-and-coming leaders. When he’s not working at Superior, Dane enjoys spending time with his family, which includes his wife, Nicole, and daughter, Baily. Dane proudly serves as an usher at his church during Sunday services. He has adopted or fostered many abandoned animals, and he loves being greeted by his dog, Mabel, every night when he returns home. Dane has always shown an interest in politics from a very young age and hopes one day to take part in a campaign.